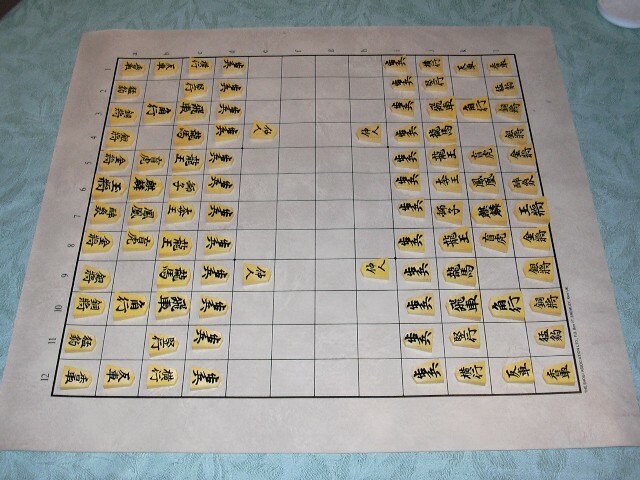 Below are some pictures of a board and pieces for Chu Shogi, a large shogi variant played without drops. The set was acquired in 1985 from George Hodges, and is still available from him (see contact information below). The board is vinyl, about 20.625 x 19 inches (52.4 x 48.3 cm). The playing surface is approximately 17 x 15.5 inches (43.2 x 39.4 cm). 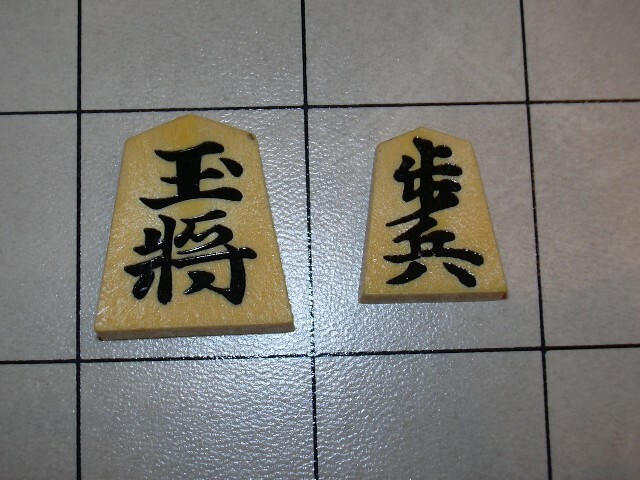 The pieces are a dense yellow plastic, with the unpromoted rank written in black, and the promotion rank also written in black, in a cursive style. The Osho (King) is about 1.25 inches (3 cm) long. The photos were taken with a Nikon COOLPIX 2000 digital camera. Chu Shogi pictures. 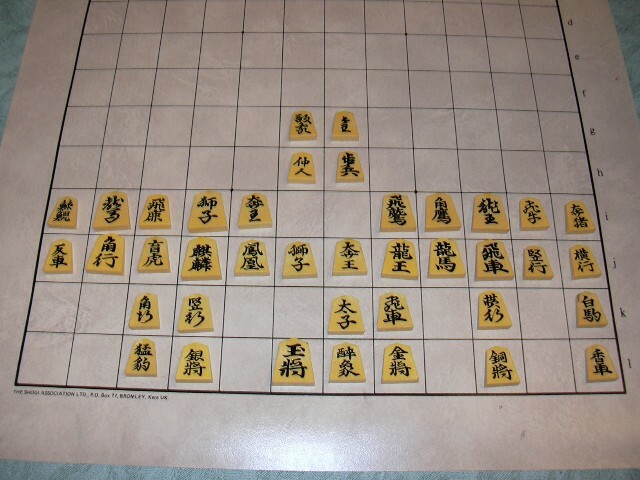 Photos of a commercial Chu Shogi set. I also went back at looked at the photo linked to, and there are substantially more pieces scattered across the board than the 60 pieces shown in the final set up. And as if this weren't confusing enough, the Wikipedia page for Chu Shogi, http://en.wikipedia.org/wiki/Chu_shogi , refers to "Heisei chu shogi", which seems to be Chu Shogi with all the slow-moving pieces in hand at the start of the game, to be dropped later. This seems to be the same as the Heisei shogi mentioned in the post in the shogivar Yahoo group. I spent some time looking for Heisei shogi online, and found nothing conclusive in English. I neither speak nor read Japanese, so I have to leave that research for others. Thanks much for the link. That site seems to be unavailable when I follow the link, so I will have to check back later. 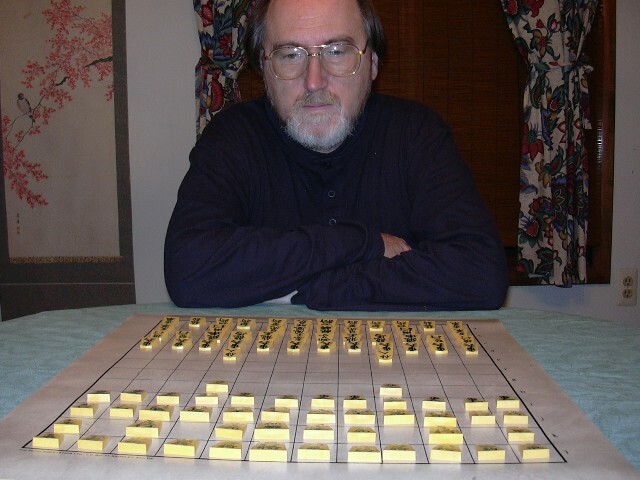 The shogi variant in the referenced photo seems to be played on a 10x10 board with 30 pieces on each side, but the pieces clearly belong to a chu shogi set both from the distinct types visible in the initial array shown and the unused pieces in the blurred detail of the upper picture (I think that I recognize a copper general and a lance). I suppose that the detail on this blog that first caught my attention was the name of the variant, which I recognize as one used for a modern chu shogi variant of Western origin. yes sorry i did notice after i posted the person who owns site did not know about the game, and hopefully someone here does. that being said, i might of found info on it, see here .. http://games.groups.yahoo.com/group/shogivar/message/1613 also, it's free to become member of 'chessvariants' site here, and your comments are posted right away. edit- he doesn't say size of board, though description seems to indicate board is same as chu shogi, which is 12x12, so, still a mystery? the link from his post he gives doesn't work for me.